The sleeves are now one inch narrower than last time, so while it might not look that different, the sleeves feel more fitted and I’m happier with how it’s looking. While the sleeves are a bit more fitted, there’s still an issue of fabric bunching under my armpit. I know I need a some ease around the armpits so I can move my arms around without fear of tearing the fabric, but I think the armholes need to be a little less deep. So, I’ll be wading into the shallows of the frog pond to make the yoke a little shorter. Frogging this time round won’t be as painful as before, as I’m knitting the sleeves before the body rather than the other way around. It’s a lesson I learnt last time; issues with shaping the body can be fixed without frogging, but issues with the tops of the sleeves will generally mean frogging the yoke. I’d rather not have to rip back my knitting, but as there’s some trial and error in getting the fit right, it’s pretty much an inevitability. Something which has crossed my mind a couple of times is whether it’s worth retrying this pattern. After all, it’s a project that made me feel so frustrated that I had to put it aside and not look at it for a year. Even with that time and frustration I still like the cardigan, want to make it and want to wear it. There’s no doubt that I’m being at least a little bit stubborn about not giving up, but if I want the final product, then there’s some logic to battling on for at least a little longer. 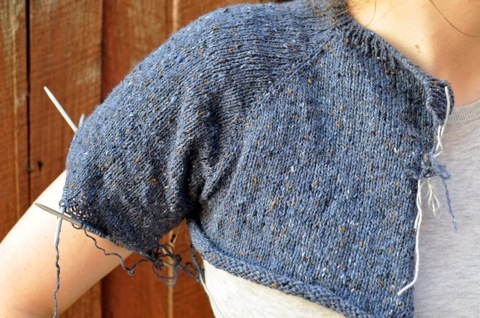 The pattern may be very frustrating and difficult, but that is amazing yarn! What is it? It looks a lot like Rowan Felted Tweed. 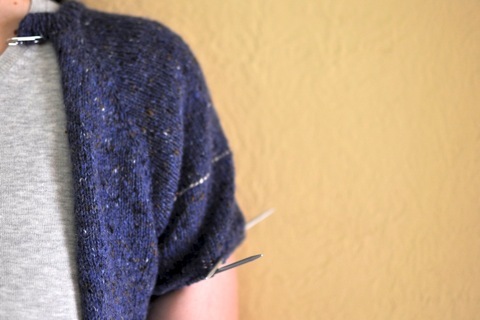 You are intelligent and experienced, why not try designing a similar cardigan? You can’t leave beautiful yarn like that just sitting around unknitted! i like the way you’re determined to get it right. the second version already looks a look better than the first, i think its worth making the effort to get it right. I hope it goes well for you after your little “wade”.